Our good friend Blackie Blackburn passed into the wild blue this afternoon from complications from heart surgery. His family was with him. His obituary will appear in the San Diego Union-Tribune, Saturday, March 27, 2010. Blackie's last instructions asked In lieu of flowers that donations be made to his beloved FIFI, the only flyable B-29 in which he devoted so many hours to. FIFI is with the Commemorative Air Force, B29/B24 Squadron. Details will be in the obituary. 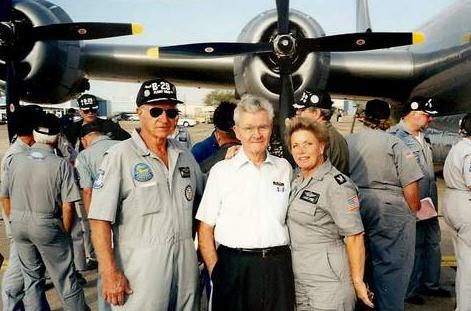 Blackie devoted his all to the aircraft that effected his and the world's life. Born in Los Angeles on May 2nd 1924, has passed on to heaven with all his loved ones by his bedside on March 22nd 2010. He was a loving husband and father and a wonderful partner and friend. Once Blackie made a friend of you, he’d give the shirt off his back to help when and if you needed it. As a man who strove to make the world a better place. He was always giving of himself to charitable causes, touching thousands of lives for the better – A True American Hero! Blackie had the privilege of being the top turret gunner on the largest, most advanced four-engine bomber aircraft existing in 1945, the B-29. 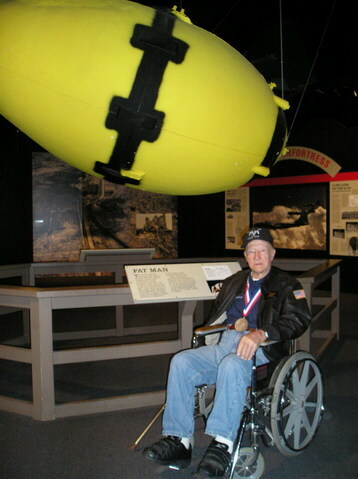 Blackie flew over 35 combat missions in less than nine months as part of the 73rd bomb wing based in Saipan, in the Marianas Islands and was part of both the first B-29 combat mission against Japan in November 1944 and the last B-29 combat mission in August of 1945. On one mission to bomb a Japanese aircraft factory, two of the groups’ planes were shot down and the lead plane was damaged so badly it could not drop its load of bombs. This critical run was in danger of failing, but Blackie’s aircraft heroically took the lead and successfully completed the mission. On another mission, his B-29 was caught in a “smoke thermal” from a bombing run over Tokyo. The incendiary attack produced so much heat, that the B-29 was immediately forced 5000 feet higher in the air, while flipping onto its back. Blackie recalled that some of the planes did not escape and crashed into the flames below. On many other missions they barely escaped death, while many other crews perished. But Blackie and his crewmates were willing and ready to sacrifice their lives for our country that they dearly loved. 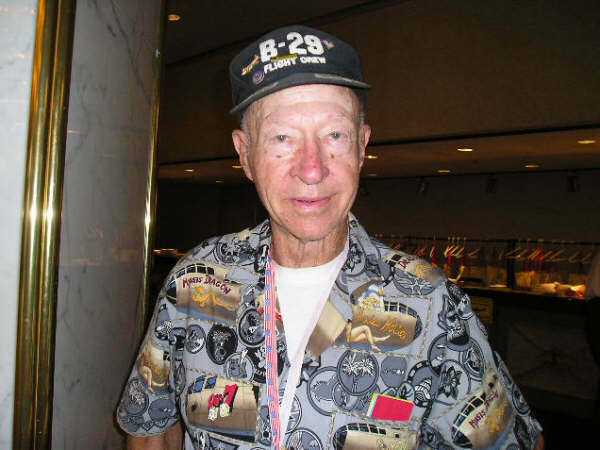 At the end of the war, Blackie participated in two mercy missions in B-29s, to drop desperately needed supplies to the interned men in Japanese POW camps. Blackie was recalled for the Korean Conflict and remained in the U.S. Air Force Reserve until 1964, retiring as a Master Sergeant. 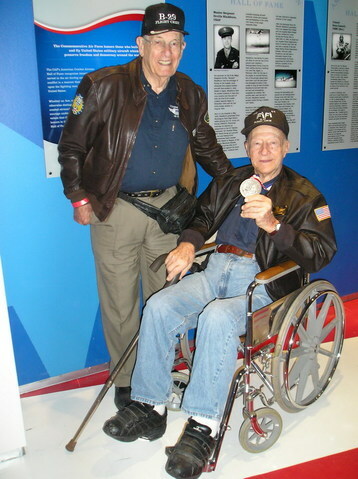 Blackie’s decorations and awards include the Distinguished Flying Cross with Oak Leaf Cluster, the Air Medal with three Oak Leaf Clusters, the Presidential Unit Citation with Three Oak Leaf Clusters, the American Campaign Medal, the Good Conduct Medal, the Asiatic Pacific Campaign Medal with Three Service Stars, the World War II Victory Medal and the Korean War 50th Anniversary Appreciation Medal. On October 9th 2009 he was inducted into the American Combat Airman Hall Of Fame. 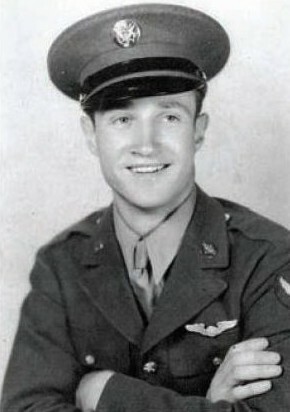 Blackie returned to the United States after World War II and attended college. After college he served with the Los Angeles Police Department as a detective for 25 years. After a brief retirement, Blackie then served with the San Diego School Police Department for 16 years and retired again in 1994. Shortly after, the only remaining flying B-29 “FiFi” landed at nearby Gillespie Field for a short stop on her cross country exhibition tour. Not expecting that the huge B-29 could land at a small airport of that size, Blackie went to investigate. He spoke with the crew who were eager to learn of his heroic service in the bomber during WWII. The captain was so impressed with Blackie, that he immediately offered him a uniform and invited him to join the crew continuing on their multi-city tour. Hours later he was aboard FiFi as an honored addition to the team. 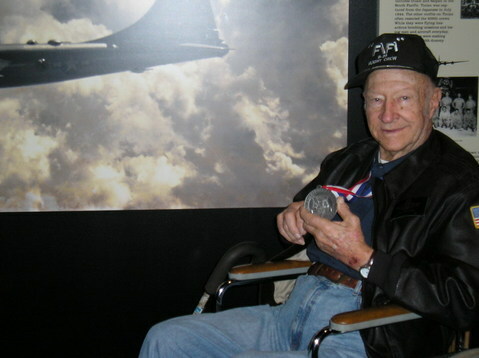 Since then, Blackie has remained with the B-29 as a lifetime member of the Commemorative Air Force, donating countless hours and money (Touring with FiFi and helping to keep her maintained) He entertained and educated thousands about this great aircraft and the brave airmen that played such a pivotal role in bringing WWII to an earlier end, thereby saving countless lives on both sides of the conflict. His patriotism and love for country was truly inspirational and will never be forgotten. He was a great man who will forever remain in our hearts. We will truly miss him. Blackie is survived by his domestic partner, Diane Johnson, his son Charles Blackburn, daughters Diane Rodriguez and Connie Risher, stepsons Dender Sotelo and Kelsey Fung and stepdaughters Jodel Navarro and Kim Ryan, 14 Grandchildren and 9 Great Grandchildren. It is with great pleasure to announce to you that Orville "Blackie" Blackburn is to be honored by the Commemorative Air Force by being inducted into their Hall of Fame. Blackie will be one of the first enlisted men to be so honored. He will be inducted at the Airsho in Midland, October 11, 2009. Blackie is longtime crew on FIFI and has trained many in the fine art of scanning on a B-29. His wartime service is exemplary having flown 37 missions. I am honored to call him my friend. 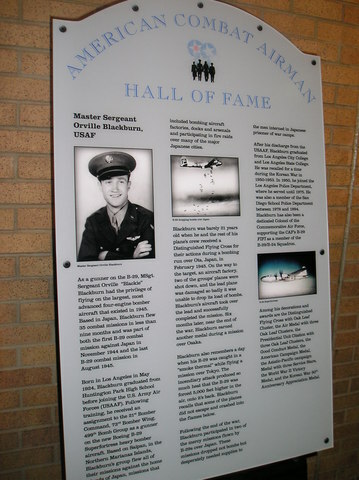 Blackie is in the Airmen's Hall of Fame. We saw many B-29 and CAF friends. Among them was Chauncey of the famous "Goin' Jessie". Please click on the camera to see the pictures taken by our friend Bill Copeland at the induction ceremony and the CAF. Thanks again, Bill! 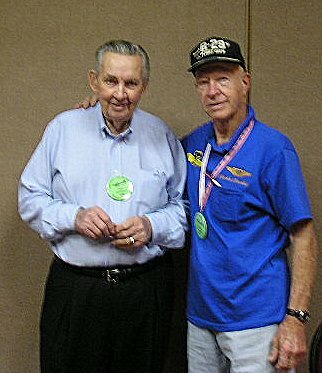 Blackie with Colonel Tibbetts, pilot of the Enola Gay, and another FIFI crew member.